Virtual Advertising Beacons that reach your prospects when they surf the net. your ads appear on Instagram, Face Book, Twitter, Yahoo and over 2000 web sites. Drop a google pin using our app anywhere in the world. Set radius from 1/2 mile to 6 miles. Pizza Box Ads – using 3500 stores nationwide – Domino’s, Pizza Huts and Papa John’s. These are a very low cost means to reach 94% of the US Population. Pricing can be as low as 10 cents per ad. 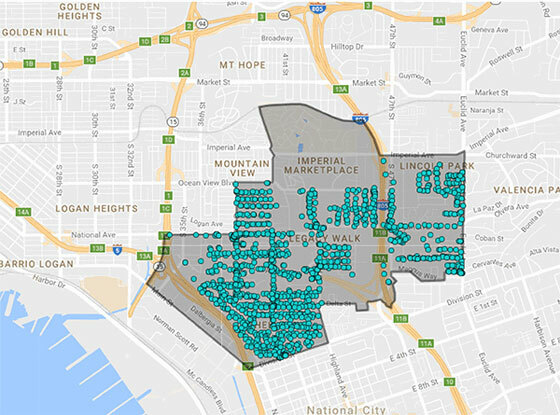 Geo targeting is easy as each store delivers within a radius of 3 mile. Door Hangers we are a door hanger company that prints and distribute door hangers across the country, nationwide service. Use our web link to access and research anything from T-Shirts to Coffee Mugs, Pens, over 500,000 items to print your logo on. ranging from 1000 meters ( 1/2 mile+ in plain English) to 10.000 meters (6.2 miles). DIGITAL MARKETING GUARANTEE - We guarantee impression results as shown above or there is no cost to you. Example = say your restaurant is located near a larger employer like the IRS or large office complex, just drop your pin and see your sales grow, It is just that simple. Call us for ideas to help your business and get details. 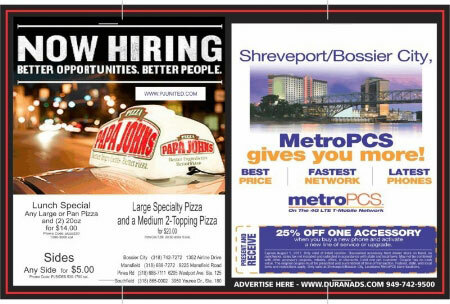 Pizza Box Ads work for a variety of business, why not yours? Call or email us for our free Media Kit. Our goal is to provide you with the best solution for your marketing and promotional products needs. Whether you need help creating a marketing program for a special event or you need a mobile-friendly, e-commerce company store solution our expert staff is here to help. Details and pricing for 500,000 ad specialty products for your next promo or trade show. 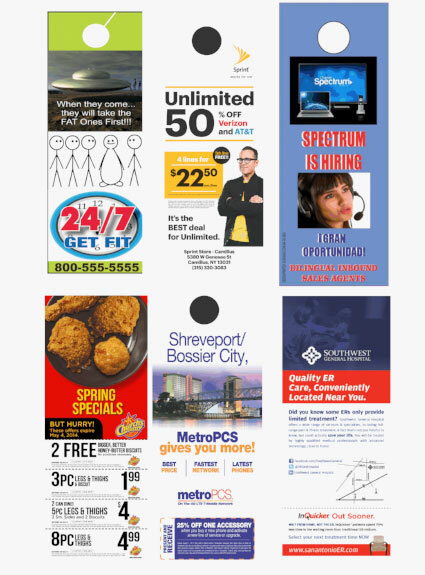 Project for MetroPCS Shreveport also included door hangers. Pizza Box Advertising works for a fraction of the cost of direct mail. What can we do for you? Why spend money on direct mail that's sent directly to the "junk" mailbox with all your competitors when you can use our door hangers to get them directly into the client's hands? This will be the easiest marketing decision you will make today! Use the door hanger link above for more info. The best part: Duran door hangers are half the cost of direct mail with 50% better results, this is not rocket science. If you wish to conduct a more traditional flyer or door hanger campaign, we can do that too. We can print and deliver/distribute these nationwide with reliable and verified results. And yes, we include printing and distribution, whether they are your flyers or door hangers or our door hangers. We will provide GPS reports and photos of your hangers on the doors. Pricing varies, so call us for a quote. We provide proof your hangers are delivered... via GPS reports and photo verification.